Gaffes such as Romney's most recent usually have a short shelf life, although Obama should still seize the opportunity. "[T]here are 47 percent who are with him, who are dependent upon government, who believe that they are victims." Not surprising, the Obama campaign has swiftly responded, with Jim Messina, the Obama campaign manager, saying in a statement that "It's hard to serve as president for all Americans when you've disdainfully written off half the nation"; the Democrats have also not ruled out using the video in future campaign advertisements. "[They] believe that they are entitled to health care, to food, to housing, to you-name-it." "This is ultimately a question about the direction of the country. Do you believe in a government-centred society that provides more and more benefits? Or do you believe instead in a free-enterprise society where people are able to pursue their dreams?" If I were in the Obama campaign, it is this line that I would focus on relentlessly because this is of course a false dichotomy. While there is undeniably a moral argument to be made as to whether as citizens of the wealthiest country on earth we ought to be guaranteed access to food, education, and healthcare, there is an equally powerful pragmatic argument to be made as to why we should ensure that our citizens have access to food, education, and healthcare, because these are precisely the prerequisites needed for a productive citizenry. We have no idea where the next Bill Gates or Steve Jobs is lurking in America today. She may be the child of a family like the Romneys, who are able to provide her with the best education and healthcare money can buy. But she also may be the daughter of a drug addict who can not hold down a steady job, let alone afford health insurance for her and her family. If we as a nation are to best harness the human capital of our people, we need to give both of these children the ability to "pursue their dreams" as Romney put it; otherwise, we are wasting opportunities for our society to meets its true potential. Romney points to the growth of citizens receiving food stampsduring the current recession as evidence of Obama's big government problem. Of course, the other way to look at the use of food stamps increasing during a recession is as ensuring that children have enough to eat so they can go to school and learn on a full stomach when they might not otherwise be able to do so due to forces beyond their control (housing market crashes, globalisation, outsourcing of factory work). This extra money for food stamps is thus increasing, not inhibiting, the ability of Americans to "pursue their dreams". Indeed, I think this is exactly the point Obama was trying to make in July when he committed one of his own campaign gaffes, the now infamous "you didn't build that" line. Obama was trying to stress that success in business in America - while of course requiring individual initiative, creativity, and hard work - also depends on all sorts of factors that are beyond any one individual's personal control: Access to training or education; being able to go to work because you are healthy and concentrate when you are there because you are well fed; having access to infrastructure like roads, telecommunications, and a functioning court system; and being able to hire workers who can competently perform their duties to their own education, health, etc. In the parlance of American football, Obama fumbled the ball that day, giving the Republicans an opportunity to avoid his larger message and instead ridicule the smaller gaffe. Yesterday, however, Romney fumbled the ball right back, and the Obama campaign should seize the opportunity to return to the original question: How best do we harness the potential of the American people? Is it really to leave everyone on their own, to the resources provided to them by the accident of birth? Or is it to have a government that actively tries to provide opportunities to all, so that everyone has a chance to "pursue their dreams"? "No discernible or certainly consequential movement because of Obama's two 'gaffes'. The only movement after Romney's comments about the Libya attack is in his favour, thanks largely to the probably inevitable tightening after Obama's convention bump... Many a news cycle was built on a 'gaffe' with a remarkably short shelf life." 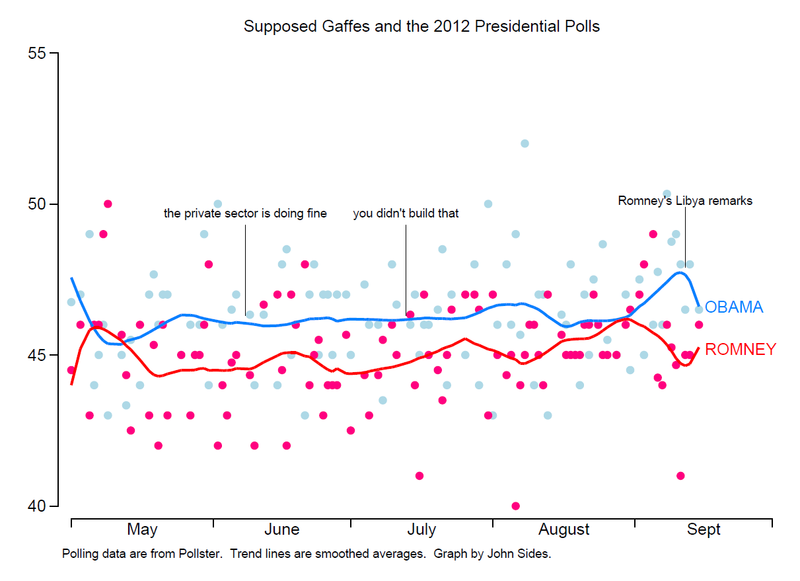 Sides also has similar data from the 2008 presidential election, showing again no real effects for campaign gaffes on overall poll numbers. The bottom line: Romney has once again demonstrated the ability to be his own campaign's worst enemy and given the Obama campaign an opportunity to talk about an issue that draws an important contrast between the campaigns, but a week from now we'll probably be talking about something else entirely.